A big brake upgrade will give your front brakes more leverage (larger diameter disk = more leverage) so when you hit the brake pedal the front brakes will lock up much earlier than the rears. The anti-skid system (ABS) will help mask this problem by pulsing the front brakes until you apply enough pressure to cause the rears to start to lock up and hit ABS. This is not optimal though, it is better to keep the spacing between when the front brakes lock up and when the rears lock to a minimum (but you do want the fronts to lock up first). With a proportioning valve you can reduce the brake pressure going to the front brakes so that the front brakes lock up just before the rears. You just insert the valve into the front brake line and then dial down the pressure. Summit Racing (800-230-3030) and Jeg's sells several proportioning valves. The Wilwood unit that I used was $39.95 and will reduce braking pressure up to 57%. A brake pressure gauge will install the same way as a proportioning valve. Summit and Jeg's sells brake pressure gauges. 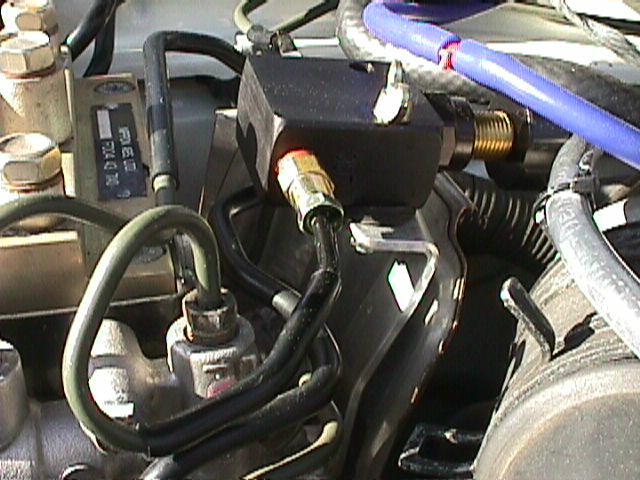 A brake line lock will install the same way as a proportioning valve. A line lock allows you to apply pressure, hit a switch that will hold the pressure, release the brakes and the front brake pressure remains locked but the rears are free for a burn out--Saturday night fun! Summit and Jeg's sells line locks. Proportioning valve (Summit Racing $40), small metal pipe cutter (for 3/16 inch line, Home Depot $7), pipe double flare tool for 3/16 inch pipe (Pep Boys $40), two 3/16 inch inverted flare nuts (Pep Boys $4), a 10mm flare nut wrench ($4 at auto parts stores--you'll round off the pipe fittings if you try to use a regular 10mm wrench), a file, sandpaper, sharp knife, pipe thread seal and brake fluid. First you have to identify the front brake line. There are two lines coming out of the master cylinder. 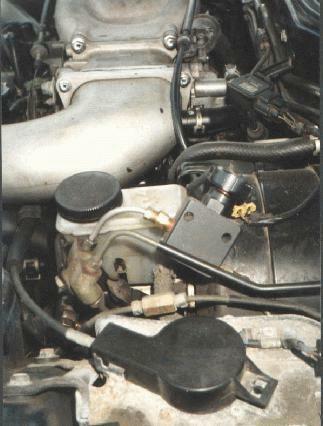 The inside line (closest to the master cylinder) is the front line (see picture below). You can install it at the master cylinder like Fritz McKeller (see picture below) or you can do what I did and put it near the ABS control unit in the right rear of the engine compartment (in front of the passenger). There's more room there for the valve. 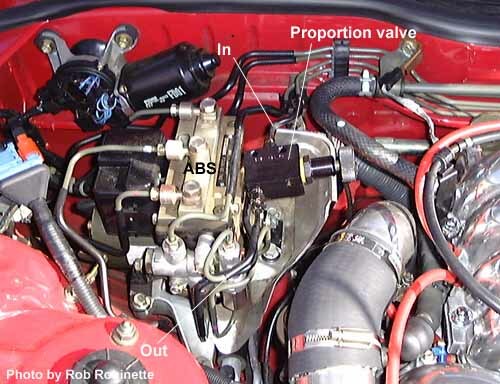 To identify the front brake line at the ABS follow the front line from the master cylinder over to where it connects to the ABS box. Fritz McKeller's proportioning valve installed on front brake line at the master cylinder. He had a new short (silver) line fabricated (note the gentle bend). You can also see how the flare nut screws into the 1/8 inch NPT adapter which screws into the valve. The "out" line is hidden by the rear brake line. You will need to cut out enough brake line to allow your proportioning valve (or line lock or pressure gauge) to fit into the line. My valve said it needed one inch but that didn't count the 1/8 inch NPT to inverted flare adapters that went on each side of the valve. I actually needed to remove about 1 1/2 inch of line. Install the NPT adapters that came with your valve. Remember to use pipe thread sealant (I used Teflon tape) on all NPT (National Pipe Thread) threads. Start the thread sealant about one thread above the bottom, you don't want any excess sealant getting into the brake lines. You do not need thread sealant on the flare fittings, the seal occurs at the pipe flare/flare fitting junction. Measure the width of the valve including the adapters to determine how much line to cut out. I wouldn't recommend trying to use a hack saw to cut the lines. Unscrew the brake line you are going to cut so you can gently bend it up enough to rotate the pipe cutter around the brake pipe. Plug or cover the exposed pipe fitting to prevent debris from getting in. Cut out the length of pipe where the valve will be inserted. After you cut the line you will have a separate short pipe that you can work on at your leisure to learn how to remove the plastic coating and flare the line. It will be a little harder to do the same operation on the line on the car. See the Flare a Brake Line How To to flare the brake lines. Paul Winter's proportioning valve sits on a simple bracket piece he made by bending and drilling a piece of 1” X 1/8” aluminum bar. The bracket is bolted down on one of the bolts holding the heat shield for the ABS. It is attached to the bracket with a junk bolt, wing nut, and Locktite. After you get it installed you'll need to bleed the brakes. See the Bleed Brakes how to. After bleeding the brakes apply firm pressure to the brakes for about 30 seconds and then check for any leaks at the valve or its fittings. Be sure to go easy on the brakes until you are sure they are working properly. To adjust the bias you'll have to do some test braking. You can remove the ABS fuse to make it easier to figure which brakes are locking up first but be careful or you will flat-spot your tires. It helps if you have an observer by the side of the road that can watch your wheels lock up. Start with the bias valve set to zero pressure decrease and slowly decrease the front brake pressure. I could easily hear which brakes were engaging the ABS first. Set the valve so the fronts locks up just a little before the rears. I painted the brake lines near the valve black to blend in with the rubber coated factory lines. Enjoy.